Best Friend – Little Pete aka his little viking. Favorite scent – Air venting from a car tire. Favorite song – Hey Sandy by Polaris. Pros – Is quite literally the strongest man in the world. Has once driven a golfball 300,003 yards and moved a home exactly one inch off its foundation. Has foiled numerous plots devised by “Endless” Mike Hellstrom, Fran “Pit Stain” Jones and Paper Cut. Cons – Could not defeat the nefarious bowling ball “Rolling Thunder” during one-on-one combat. Outlook – A low risk, high reward signing by the 76ers. Will be one of the most skilled members of a young 76ers squad. Has yet to be seen if his prancing on the court or yelling of the word “pipe” will be a distraction during games. Only willing to appear and play in official Krebstar athletic gear. However, to ensure success, he has to resist urges to mentor young teammates and then leave the team during the most pivotal moments of their career to show them the strength they have within themselves. 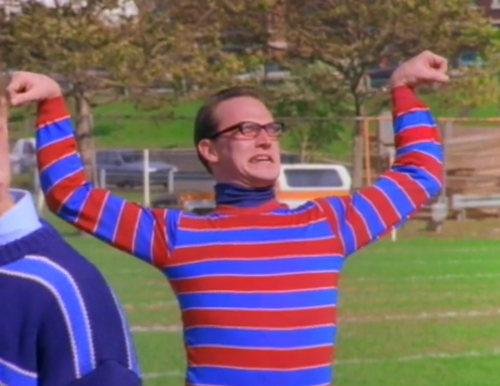 Except Artie had already skipped town in search of another boy who needed a superhero by the time Pit Stain became little Pete’s new arch nemesis.